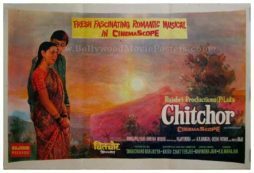 Beautiful hand painted old Bollywood movie poster of the hit Hindi film, Chitchor (1976) for sale. This is an actual surviving old Bollywood movie poster of the 1976 romantic film that featured Amol Palekar and Zarina Wahab in lead roles. Printed and circulated during the first release of the film (somewhere in the mid 1970s), this vintage Bollywood poster was originally designed for publicity of the film but never ended up being used. Very few old Hindi film posters were designed in a horizontal/landscape format, making this poster incredibly rare and highly collectible! This poster was originally designed on a hand drawn canvas by master Bollywood movie poster artist/painter B. Vishwanath. 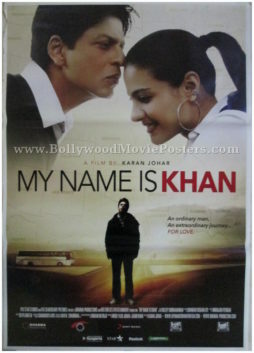 The poster bears his printed signature on the bottom left. The lettering on the top of the poster announces the film as a “Fresh fascinating romantic musical in cinemascope.” Beautifully hand drawn portraits of the lead actors are seen in a romantic pose on the left of the poster, with a landscape sunset background towards the right. 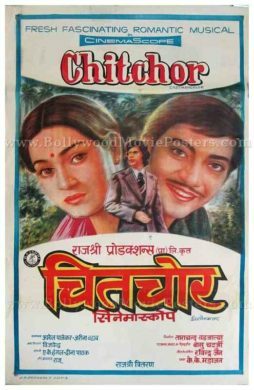 Chitchor (sometimes spelled as Chit Chor) is a 1976 romantic musical Hindi film starring Amol Palekar & Zarina Wahab in lead roles. An adaptation of a popular Bengali story, Chittachakor by Subodh Ghosh, the film became a box office hit. The film’s success spawned a remake in 2003, ‘Main Prem Ki Diwani Hoon’ starring Hrithik Roshan, Kareena Kapoor and Abhishek Bachchan. Quirky hand painted Bollywood poster of the hit Hindi film, Chitchor (1976) for sale. This is an actual surviving old Bollywood poster of the 1976 romantic film that featured Amol Palekar and Zarina Wahab in lead roles. Printed and circulated a few years after the first release of the film (somewhere in the late 1970s), this vintage Bollywood movie poster was originally designed for publicity of the film but never ended up being used.